D&J Warden is farmed in partnership with David and Jenny, we are 1st generation farmers. 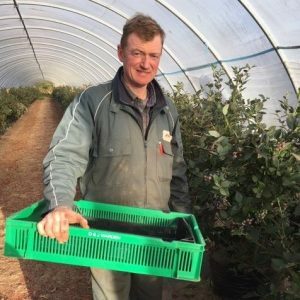 David has been involved with soft fruit for 19 years having been Farm Manager for Lochy Porter for 11 years. At North Mains of Dun we produce strawberries, blackberries, raspberries and blueberries for Angus Soft Fruits. We also have sheep, cattle, pigs, poultry and grow cereals, grass and let land for potatoes and peas. David does contract and advisory work and is a Lantra forklift instructor.